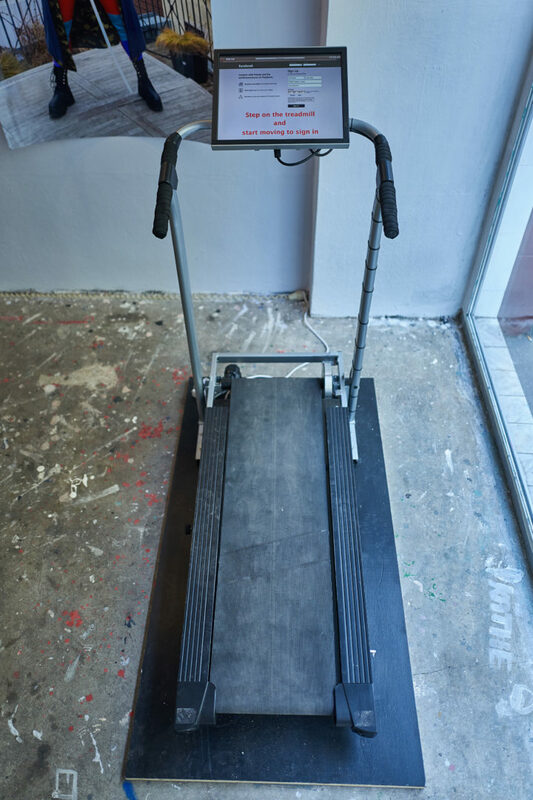 A treadmill is positioned in the middle of an empty space. 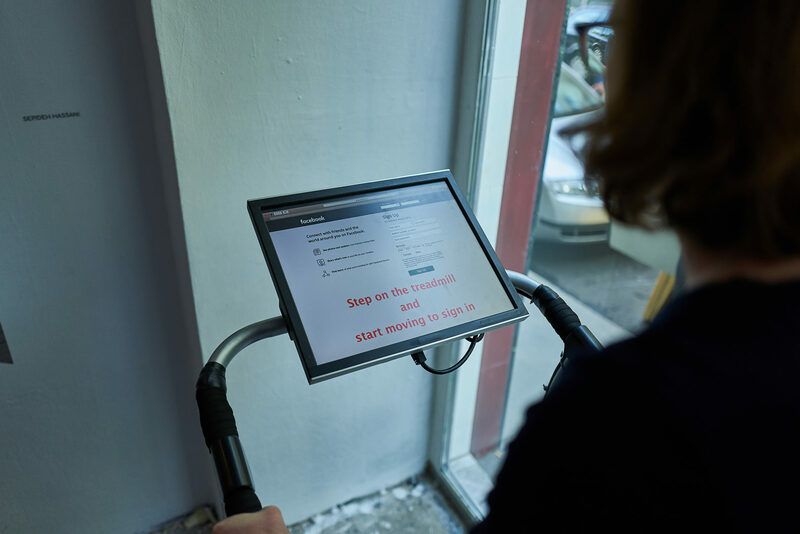 In front of the treadmill a screen is placed. It is no coincidence that this situation reminds the beholder of a scene from a gym (fitness studio). Of course the issue of self-optimisation is a major task in this video installation. But it is not the only one. As a reflection of the title, it is a matter of fitting in as well, of being part of society (of a society that operates more and more on social media platforms). This title also raises the question, whether it should be the top priority in life to adapt to standard, to bend ourselves to fulfil the norm? The People increasingly interact in virtual spaces (on social media platforms) most of the time and therefore they find themselves in daily virtual loops, which are embedded in the daily loops of the real world (non-digital world). The world is running in circles. The world is running in such circles, that you could think, history is repeating itself, over and over again. At the same time the technical progress and the digital exchange ist unstoppable and picks up speed, minute by minute. Therefore humans strive to follow this speed by boosting their bodies with endorphins, which they release by excessively practicing diverse types of sport. They want to be able to meet the challenge of the increasing tempo and prevent the possibility to fall off the rushing train of the technical progress. More and more people nowadays are looking for physical exercise, to perfect themselves, in hope to establish the optimal conditions, to keep up with this enormous pace of the world, in fact to shine. 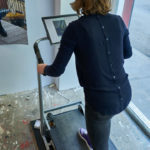 As long as the treadmill is motionless the viewer can only see the log in site of a social media platform (Facebook Log in page) with the request to step onto the treadmill to start the video installation. 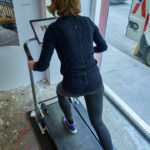 As soon as someone steps onto the treadmill and starts to walk/run, the image on the screen changes from the login page to a social media account (Fake-Account which was previously set up by the artist especially for Fit in). 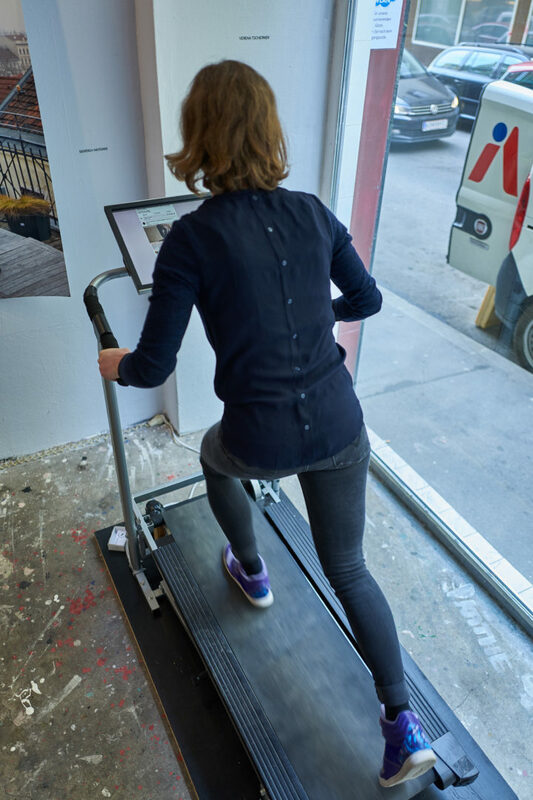 If the participant runs at a slow speed, this social media news feed is scrolled from the top to the bottom in a very high speed, so high, that it is impossible to follow or even read the news feed. 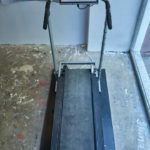 As soon as the person on the treadmill runs faster and faster the, the scrolling movement of the social media feed starts to slow down, even possible to follow and read these online posts. But the point is, that for the fast running person, who might be out of breath and stressed out, is unable to follow the news feed, because she/he is so exhausted and dizzy. 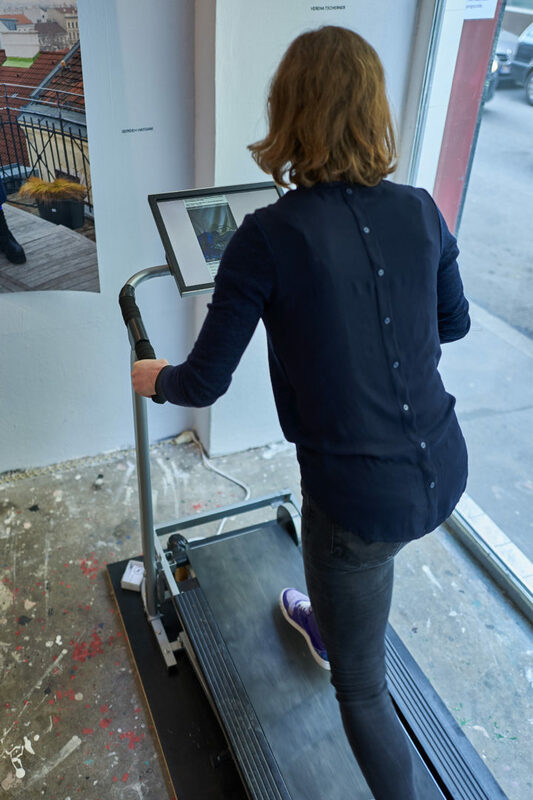 So the question now is: Is the beholder, who is currently interacting with the installation, able to find a medium speed, where she/he is in the physical and mental state to participate in both levels of the video installation? Therefore the point is to find the individual medium speed, to perceive as much as possible from the news feed while running should be bearable.